2. Closing force check: - Cover the leading edge of the glass (A) with a shop towel (B), and attach a spring scale (C) as shown. - Have an assistant hold the switch to close the glass while you measure the force required to stop it. - Read the force as soon as the glass stops moving, then immediately release the switch and a spring scale. 3. If the force in not within specification, remove the moonroof motor ( s e e page 20-96), and check the following items: - Check the gear teeth and the inner cable for breakage or damage. If the gear teeth-are broken, replace the motor. If the inner cable is damaged, remove the frame (see page 20-97), and replace the cable (see page 20-100). - Check the moonroof motor (see page 22-373). If the motor fails to run or does not turn smoothly, replace it with a new one. - Check the opening drag. Go to step 4. 4. Opening drag check: Cover the leading edge of the glass with a shop towel (A). Measure the effort required to open the glass with a spring scale (B) as shown. 5. If the load is over 40 N (4 kgf, 9 Ibf), check: - The side clearance and glass position adjustment (see page 20-91). - For broken or damaged sliding parts. If any sliding parts are damaged, replace them. 6. 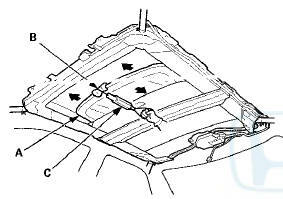 Reset the moonroof control unit (see page 22-371) after reinstalling the moonroof motor.